Minky Knits: I won, I won! There are days when you don't want to get out of bed and there are days when you are very happy you did get out of bed! I entered the contest on Amy O'Neill Houck's blog to win a Spud and Chloe kit for her Aztec scarf pattern. Lo and behold, I won! Many thanks to Amy and the people at Blue Sky Alpacas! I hope my burgeoning crochet skills will do justice to the beautiful pattern and yummy yarn. The same week, I read Clara's review of Spud and Chloe and ordered some Fine and Sweater yarn from kpixie. 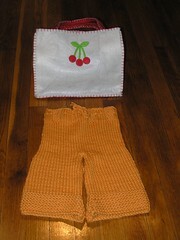 I knitted a pair of toddler pants in two evenings and fell in love with Sweater. I'm not a big fan of cotton but this is different. It's cotton and merino. It's squishy. It comes in awesome colors. It's machine washable. It's my new best friend for handknitted baby items. I was in California earlier this week and was able to stop by the Purlsoho.com warehouse. Even though it was a warehouse, the fabrics and yarns everywhere made the whole place magical. I have never seen so many colors of Koigu KPPM (I don't think there are as many colors in the Purl location in New York) so I picked up a couple of Koigu skeins and... two more skeins of Spud and Chloe Sweater. This might become as addictive as sock yarn.